It might be hard to imagine that a hectic, bustling city like Ho Chi Minh City (previously named Saigon) would have much to offer young families and children. So it might surprise you that you can indeed keep both parents and kids happy and amused when you visit Ho Chi Minh City. There are plenty of activities for families and children! 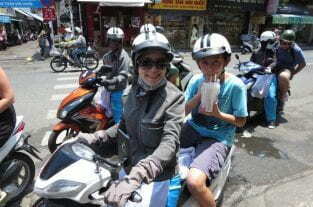 Kids of all ages will love riding on the back of motorbikes in Ho Chi Minh City. We took our three kids (aged 2.5, 10 and 13) out for a day that we’ll all never forget. The kids keep asking to go motorbike riding again! A younger child can sit between the driver and yourself, which isn’t as scary as it sounds. If you use a reputable company like number one rated XO Tours, you’ll be perfectly safe and insured. Motorbike riding is a super fun way to spend half or a whole day in Ho Chi Minh City. In Vietnam, they can only travel up to 40 kilometres per hour — it’s not like riding on freeways back at home. For a little extra, XO Tours can film your trip and you’ll have an awesome take home memory. All the drivers are female and great fun to hang out with — you’ll be so glad you did this! Younger children and parents alike will love the Snap Cafe playground. With a playhouse, sand, swings and climbing toys, it’s a must for a sanity break! The food is great and the kids can play right in view of the seating area – it’s a win win! The Snap Cafe website is a dual purpose website for real estate and the cafe, which doesn’t provide many images or details aside from the address. You’ll get more information from Trip Advisor’s page for the Snap Cafe here. Located in District 9, Suoi Tien Theme Park is Ho Chi Minh City’s most famous theme park, and offers a fun day out for kids of all ages. The grounds are massive – the park includes a waterpark with slides, amusement rides, beautiful gardens and temples. Do be aware though that the safety standards in South East Asia are not the same as western countries, so check rides before you go on them, and if you don’t feel that it’s safe enough, give it a miss. Some of the walk through attractions may frighten young children, so be aware of those too. Don’t let it put you off though, there are many interesting sights and structures to see! As with most attractions and activities in Ho Chi Minh City, opt for weekdays during business hours to avoid bigger crowds. Suoi Tien is open from 7am to 5pm Monday to Friday and 7am to 6pm on weekends. For more information, click here. For families with older children, don’t miss an opportunity for a highly interesting and educational visit to the Cu Chi Tunnels. The Cu Chi Tunnels were used by the Viet Cong during the Vietnam War. The tunnels provided them with hiding spots during combat, communication and supply routes, living quarters for many guerrilla fighters and so much more. The tunnel systems were of great importance to the Viet Cong in their resistance to American forces, and helped achieve ultimate military success. Learning about — and even crawling through — the tunnel systems they fought in, the clever booby traps they devised and the tactics that helped them to survive will leave you in awe. You can book tours via your hotel, else you can do some research to compare the best tour companies. Either way, make sure you choose a reputable company and check reviews online (with any tours in Vietnam). Especially if you’re visiting the Chu Chi Tunnels, make a stop into the Wildlife Rescue Station! Teaching kindness and care towards animals is something important to expose our children to, and the work they do at the Chu Chi Wildlife Station is fabulous. Some animals you may see include bears, gibbons, wild cats, turtles and many species of birds. The entry fee of 200,000 VND per person goes back into feeding and caring for the animals. Please be aware that you do need to book ahead, as it’s not available all hours due to staff workloads. KizCiti in district 4 offers a totally unique and fun day out for kids aged 3 to 15! The grounds are literally like a city designed especially for kids, with buildings, banks, streets, trees and more. Your children will have the opportunity to see what it’s like being an adult for a day, by trying out up to 24 different occupations! They get to dress up as firemen and use hoses, pop on a nurse’s costume to take care of patients, become an ice-cream maker, a pilot and so much more! When they work, they earn the currency called ‘Kizo’ to spend. A bracelet tracks their money and they can explore the grounds earning or spending their money. Kids are free to roam on their own, while parents can either wait in the streets or sit in the air conditioned restaurant while their children play. Kizciti is open from 8:30am until 9:30pm and does tend to get busy with school children during the day. You can avoid this by going at around 3:30pm or visiting on weekends. The entry fee will set parents back 180,000 VND ($10.80 AUD, $8.25 USD) on weekdays and a little more on weekends. For more information, see their website here. TiniWorld is a chain of indoor kids play centres in Ho Chi Minh City. The play centers are modern and similar to what we are used to back home, with ball pits, climbing frames, little ride-ons — and even more! There’s an area where kids can paint plaster moulds, make jewellery and ride on pint sized, token operated rides. It’s a great way to beat the heat in an air conditioned play centre! Make sure you avoid peak times like weekends and after hours, it gets very busy and very noisy! The website is poorly translated into English, but click the English link up the top right and navigate to the visit page. Select your district/region, and from there, you can check how far it is from your hotel using Google maps. Else you could try and ask someone who speaks English (e.g. hotel staff) for directions on which is closest. Some are located in the Vincom Centres and what they offer varies a little, depending on where you go. For more information, click here. Get yourself a front row seat (unless you’re adverse to getting a little wet!) and enjoy all the singing and splashing of a traditional water puppet show! Lasting for around 50-60 minutes, kids will love getting a splash or two from these beautifully crafted puppets. Even toddlers will be mesmerised by the colour, singing and laughs in the show (which is in Vietnamese, but still worthwhile!). It’s easy enough to book tickets via your hotel or a reputable tour company. Expect to pay around 180,000 VND. Find out more information here. In District 2, you’ll find the BeeBee Activity Centre which is another fun, air conditioned indoor play centre. With a designated toddler play area, a rock climbing wall, ride-in cars and all the usual play centre activities, your kids will be happy and you’ll be glad to be out of the heat! Entry is 100,000 VND. For more information, visit the BeeBee website. Thank you so much for this atticle! We are tagging along on my hubbys work trip with our almost 2 year old and I was worried we would t have anything to do during the day! This is so helpful! Hi! We have a one year old and a four year old. Is the little one too little to join the bike tour? Thanks!!! You might have to contact them to ask how you can manage your 1 year old. It’s so worth it if you can though, our best memory in HCMC! I’m confused, you’re in Nha Trang but you want to do things in HCMC? 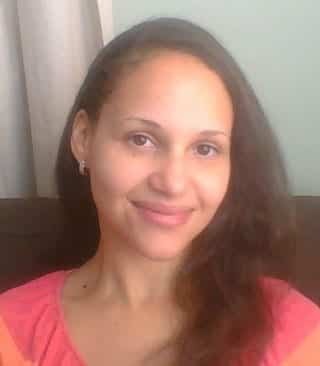 Hi Kelly, thanks for recommending XO – we did the Scooter highlights with the ladies and a video crew. It was fantastic and we would love to go back again to do more! Thanks! Xo tours look awesome, I think I’ll try that for sure. Sounds like a nice way yo get a cool youtube vid as well, I’d like to give that a shot. We tries doing a water puppet show in Hanoi, very surprised at how entertaining it was. Great review, I think I’ll get to try 3 or 4 of these in our upcoming 2 week trip.